Older people are set to benefit from golf lessons after a new report showed that the sport helps to improve patients' physical, mental and emotional health and wellbeing. This follows a joint report from ukactive, England Golf and Mytime Active - based on two research pilots called 'Golf on Referral' - saw patients at risk of chronic conditions referred for a six-week behaviour change and golf lesson programme. The results showed that participants trebled their amount of exercise per week as a result and had increased life satisfaction levels alongside reductions in both systolic and diastolic blood pressure. Health professionals are now being encouraged to refer older and inactive patients to play golf, in order to increase physical exercise as well as improve mental and emotional health throughout the age group. ukactive CEO Steven Ward highlighted the benefits of the scheme, saying: "We all know our national activity levels are well over par on where we need to be. "Golf is a fantastic way to encourage people to be more active, particularly among parts of the population who may not be too engaged with other activities. 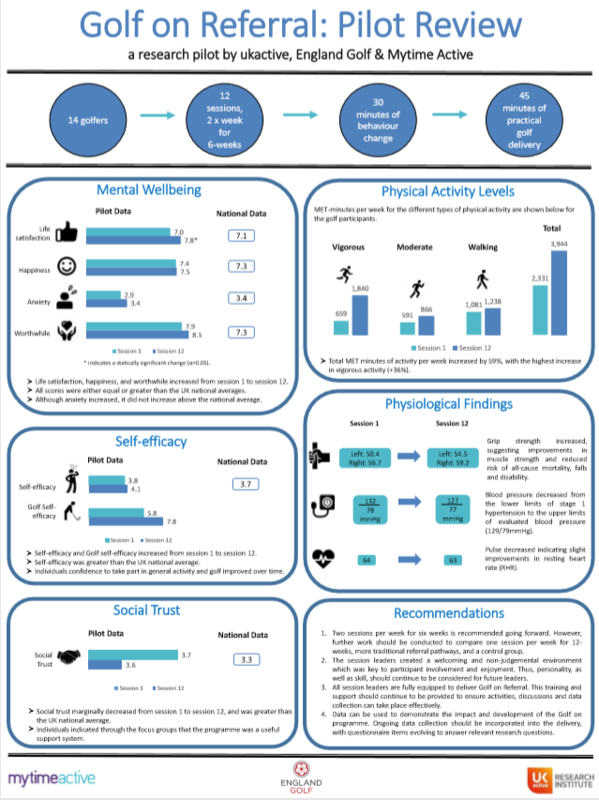 "This research shows that there are clear mental, physical and emotional benefits for Golf on Referral. We should look to roll out more of these programmes across the country as part of wider efforts to get the nation moving." Abbie Lench, England Golf's Head of Club Support, added: “We’re thrilled to see this scheme developing from our earlier research into the impact of playing golf on health and wellbeing, which we carried out with the support of Mytime Active and ukactive. Pippa Bagnall, Mytime Active's Head of Wellbeing, said: “Improving physical strength, enjoying exercise in the fresh air, reducing health risks and developing new friendships is a wonderful way of enjoying life rather than giving in to ill health”.